I just love this time of year – everything is sparkly, lights are twinkling in the trees, and of course, d’lish candy canes everywhere! There are candy canes found hanging on trees and peeking out of stockings. They are also an ingredient in many of my favorite holiday goodies! Peppermint and chocolate – oh yea! I love to sprinkle crushed candy canes on chocolate chip cookies or brownies before baking. 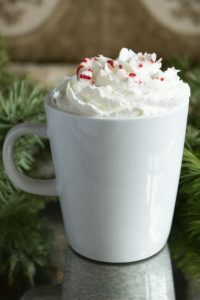 Or what about a Spiked Candy Cane Coffee! Baileys, Jäger, a hint of peppermint, and hot coffee topped with peppermint whipped cream and of course crushed candy canes. Recipe is below, but if you’re flying out of Sea-Tac Airport this month you can also sip one at Rel’Lish Burger Lounge on Concourse B.
Who’s ready for a sip of Spiked Candy Cane Coffee? And have you ever had candy can infused vodka? Just combine 1 1/2 cup of vodka plus 8 – 10 starlight peppermints or 6 mini candy canes in a jar with a tight fitting lid. Shake a couple of times a day until dissolved. Voilla – Santa’s little helper! Enjoy it in your cocoa or frozen as a shot. In a coffee mug, measure in the Baileys, Jägermeister, peppermint syrup, and hot coffee. Stir to combine. Garnish with a swirl of Peppermint Whipped Cream and a sprinkling of crushed candy cane pieces. Measure ingredients into an iSi whipper canister and charge with 1 (N2O) whipped cream charger OR mix together in a bowl until the cream reaches soft peaks. The holidays are here and for many of us that means some long flights. I fly a lot so I understand it’s not always fun or d’lish, but I’ve got some tips to help with that. If you’re flying out on a long flight (domestic or international), make sure to pack some food. Bring items that are compact and nutritious, and also won’t go bad. Some of my fave go-to’s: protein bars, raw almonds, Laughing Cow Cheese wedges (these are ok at room temp), squeezable almond butter, easy peel tangerines, baby carrots, and baggies of crackers or gluten-free snacks. And don’t forget snacks for the kids that are not messy or smelly. Skip foods that are salty and try to avoid items that will dehydrate you, such as coffee and Bloody Mary’s on long flights – tempting as they might be. Remember the “puffy factor” when you fly! And make sure to drink lots of water – your body will thank you. It’s always good to be prepared. 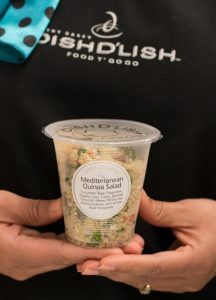 And if you’re flying out of Sea-Tac check out Dish D’Lish (on Concourse C) to pick up some healthy and tasty in-flight snacks for on the go, like a protein-packed Mediterranean Quinoa Salad or an Apple & Almond Butter combo. Now that cold weather is here, starting your day with a hearty breakfast is essential. And an easy go-to and one of my favorites is good ol’ fashioned oatmeal! Oatmeal is easy enough to make BUT not everyone has that time in the morning.Don’t fret – quick batches of overnight oats makes your morning meals for the week as quick as grab-and-go! One of my fave recipes is Golden Honey Milk Oats. It’s made with organic gluten free oats, chia seeds, turmeric, honey, coconut milk, and cinnamon – loaded with good-for-you ingredients. Make a big batch and portion into half-pint canning jars, then let sit overnight. The next morning, just grab a jar – top with some berries or fresh fruit and you’re good to go. 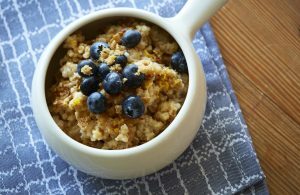 Or for an overnight set it-and- forget it-style recipe, try my Slow-Cooker Citrus Maple Oatmeal – made with fresh orange juice, maple syrup, ground cinnamon, and steel-cut oats. Mix together, then put it in a crockpot on low. When you wake up, breakfast will be ready, and your house smell d’lish too! Add a D’Lish twist to your morning routine with this breakfast play on the popular golden milk- healthy and gluten free, with a touch of spice and sweet honey. Top with sunflower and pumpkin seeds, and dried fruits if desired. Combine ginger, spice mix and coconut in a bowl and whisk together until honey is dissolved. Stir in oats. Cover to let oats plump overnight or for at least 12 hours. Stir before serving. Combine ingredients and store in a small jar at room temperature. Be sure to use steel cut oats for this preparation. Serve with some fun toppings, like fresh blueberries or sliced bananas—and brown sugar for those who like their oats a touch sweeter. In a large mixing bowl, whisk together orange juice, water, milk, maple syrup, cinnamon and salt. Generously spray inside of a 3-4 quart slow-cooker with nonstick cooking spray. Add oats and then pour in liquid mixture; stir. Set cooker to low heat and cook for 7-8 hours. Recipe by Kathy Casey Food Studios® for Sunkist®.